The pin was given to STAFF people only at the KISS Concert held in Hard Rock Cafe BRAZIL. The pin is Brand new. It will be sent in a wrapped bubble envelope. 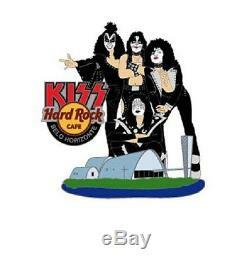 The item "Hard Rock Cafe BELO HORIZONTE KISS PAUL GENE Band Group STAFF pin" is in sale since Tuesday, August 29, 2017. This item is in the category "Entertainment Memorabilia\Music Memorabilia\Rock & Pop\Artists H\Hard Rock Café\Pins".